Have you ever dreamt of being on the stage? Or maybe you are seasoned and want to add another crown to your collection? SO, YOU THINK YOU CAN DRAG? 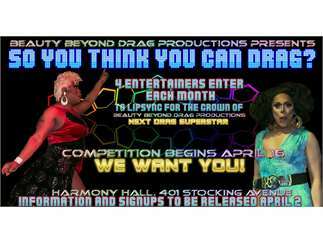 Well, here's your chance to become Beauty Beyond Drag Productions' next drag SUPERSTAR! Begins monthly on Tuesday, April 16 at Harmony Hall. 4 entertainers enter into a collision course of lipsync challenges and 1 leaves victorious. Judging goes by audience participation, so you are going to want your friends and family in that audience! Winner of the night will win a prize and be invited back to Harmony later this year to compete for the crown in the finale. Signups will take place April 2 and we will take the first four to sign up for the first round of competition! You can be any age, size, gender, ethnicity, color, etc. Signups and more information coming soon! If you miss April's signup, don't worry! This will be a monthly gig and at the end of the 6 months, we will have a finale, pitting all winners against each other for one final showdown! Finale prize package to be announced!